Rob says: “Solanum pimpernelifolium produces tiny fruits, hence the name. 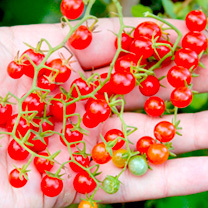 It’s a different species from your common garden tomato and its hardly changed since it was found growing wild on a Peruvian beach in 1707. The plants are very disease resistant, and can tolerate cooler temperatures. Each tiny tomato is crisp, and has a really intense, sweet/tart flavour. Good in salads, or straight from the plant. These tomatoes will reward you with fruit every day. Grow them as you would any cordon tomato and pinch out the side shoots (you can leave a few side shoots if you forget). They may be confused as they were found growing on a beach on the floor, but that's because they were wild. To get the best from the plants when they are trained up a cane, they will grow to around 1.5-2m in a greenhouse." For heated greenhouses sow January onwards and unheated/outdoor March-April at a temperature of 16–18°C (60–65°F). Transplant into 9cm (4") pots. For the greenhouse, plant late Apr-May in large pots, growing bags, or border soil. For outdoors, plant early-mid June after ‘hardening off’ plants. Plant spacing 45cm (18”). Pinch out sideshoots (other than basket or bush varieties) regularly and when in flower shake plants daily to aid fruit set. Harvest July-mid October. HEALTH BENEFITS: A recognised ‘superfood!’ Packed with antioxidants including vitamins A & C and lycopene. Also high in vitamin C, stimulating the body’s immune system. CULINARY TIPS: Try slow roasting for 1½–2 hours in olive oil with sea salt and black pepper. Scrumptious!